This is not the first time The Mesimer Team sold a home in such a short period of time. With our excellent marketing campaign combining print, email and web marketing strategies The Estelia Mesimer Team’s listings move fast. With the help of Keller Williams’ leading edge technology The Mesimer Team is able to push listings out to over 300+ online real estate services including Realtor.com, Zillow, and Trulia on listing date. More and more buyers are turning to the web to find their dream homes, having your listing syndicated to as many platforms as possible allows your property to receive the exposure it deserves. The Estelia Mesimer team does not stop there. Within the first week of listing dates professorial photos are shot and custom-made panoramic postcards printed and mailed to potential buyers. Most importantly, every single one of our clients receives not only the undivided attention of Estelia Mesimer, but the entire team. There is no doubt that The Mesimer Team will be working resiliently to ensure a no fuss, rapid sale of your property. If there are any questions, comments, concerns or suggestions the entire team is a call, text or click away. To go above and beyond we featured this property in an ad in the popular luxury publication Bay Magazine. Click here to take a look at the ad or read through the description below. Picture yourself in the private gated community of Bayway Isles, a traditional home that is anything but traditional, waits for you to appreciate the home’s one-of-a-kind detail. With all the amenities of waterfront living, this three bedroom, three bath, home with office space and two-car garage, includes travertine floors throughout, a fast heating salt water spa, swimming pool and boat dock. Thermador ovens, Miele cappuccino machine, large marble cook-top, French style porcelain sink and mother of pearl lined prep sink. Enjoy a coffee at the breakfast bar, made of Marfil Cream stone and glass with unique crystal-ball-like LED lighting below the glass creating a dazzling effect. In the family room, the large flat screen TV built into the wall serves as the brain of the house controlling many of the multimedia systems installed throughout the property. Decorated with a custom mosaic you’ll find that the saltwater pool and spacious spa heat in just minutes because they’re fueled by propane. With walls tiled with onyx stone, the master bathroom feels like a full-service spa and features a Whirlpool tub and multi-head shower/steam room, a Toto Washlet bidet system, and a walk-in closet. Enjoy entertaining with the 200-bottle wine cellar located off the family room, and surround-sound speakers throughout the property perfectly suited to their needs. A utility room includes Whirlpool standing washer/dryer and second dishwasher. A removable child-safe fence protects the pool and the fenced back yard is perfect for pets. 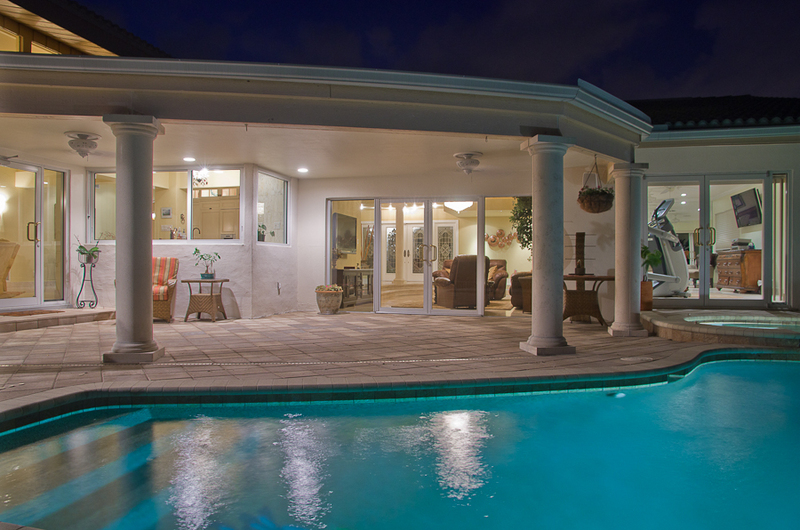 This stunning home is the ideal place to entertain, raise a family, enjoy a boating lifestyle and all the essential amenities of Florida waterfront living. All this done in a miraculously short period of time resulting in a sale of the property in just 8 days from the listing date. Become another Mesimer Miracle and schedule a free listing consultation today!